Jacob Lorde has returned to his hometown of Blessings, Georgia, after his eight-year stint in the army. A limp serves as a visible reminder of his close encounter with an IED. Despite the limp and some residual pain, his body has healed faster than his psyche. PTSD means that unexpected noises can trigger flashbacks and nightmares shatter his sleep, but Jake hopes he can find healing for his war-weary soul in his peaceful hometown. Although his father’s death means home is different, he takes comfort in all that remains unchanged. 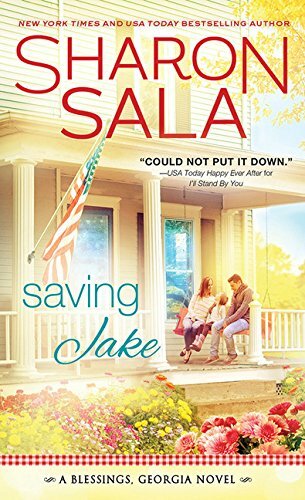 If he can just convince the people of Blessings that he’s no hero regardless of his Purple Heart, Jake just may be able to build a life for himself in the tiny mountain town. Laurel Payne recognizes Jake Lorde when she sees him walking home. She has known Jake all her life. Even so, she is tempted to ignore him. His uniform is an all too vivid reminder of her late husband Adam who returned safely from his time in Afghanistan only to kill himself with his own gun a few months later. She doesn’t need the reminder, but her conscience will not allow her to ignore the limping veteran. She turns her old pickup around to offer him a ride home. Neither Jake nor Laurel is looking for a relationship. Jake has enough to deal with making repairs to his parents’ home that is now his, adjusting to civilian life, and deciding what he’s going to do now with his time now that he has been discharged. Between cleaning houses to support herself and Bonnie, her six-year-old daughter and caring for her child, Laurel has little time for anything else. The enmity of her husband’s family, who hold her responsible for Adam’s death, makes her life more difficult. She is also still haunted by the horror of discovering her husband’s bloody body in their bedroom and angry with him for leaving her and Bonnie. But Bonnie is charmed by Jake who reminds her of her daddy, and she will not allow her mother to ignore their lonely neighbor. Jake and Laurel begin as helpful neighbors and soon become friends. Friendship morphs into a love that will bring healing to all of them if Laurel can open her heart to trust again. 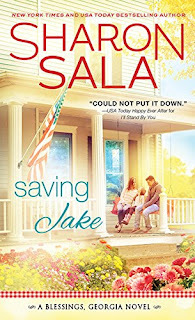 Saving Jake is the third book in Sala’s Blessings series. The idyllic small town is filled with quirky characters who care for one another and are not shy about beneficial meddling. Jake and Laurel are sympathetic, vulnerable people who deserve an HEA, and Bonnie is a believable six-year-old who touches the reader’s heart and, along with her pet chicken Lavonne, evokes a few chuckles. This Eden is not without its serpents, but one is a singularly inept villain, and the other, whom I found the more horrifying, is unwittingly self-destructive. Both get their just deserts. However, we are also told that Blessings is near Savannah. That lovely city is located on the coastal plain, and the highest elevation is only about fifty feet above sea level. Although “mountain” can be used somewhat loosely, “mountain town” in Georgia generally refers to places such as Dawsonville, Ellijay, and Hiawassee in the northern part of the state. * Some would consider this confusion a minor point, and certainly many readers will not notice it. But it was enough of a problem for this reader to keep the book from being an unqualified great read. Regardless, Sala’s voice is wonderful, Blessings is a delightful place to visit, and I recommend you add it to your itinerary. I’m sure I will be returning in May when the next book in the series is released. * I should note that I read an ARC of the book. It is possible that a mountainous Savannah does not appear in the final edition. I would probably not notice mountains in Savannah. It does sound like a great read though. Didn't know this was coming out. Thanks for bringing iit to my attention. I always enjoy a book that tackles PTS in any form. I'm sure I'll enjoy this one as well. And double cookie points for the Savannah reference. Ive often wondered if an author makes up places as they write their books or if they depict them as they truly are. I guess that depends on the author, huh? My ex-husband was a Viet Nam vet, when Desert Storm was going on we had some issues with flash backs and dreams. I just got this books from my library.